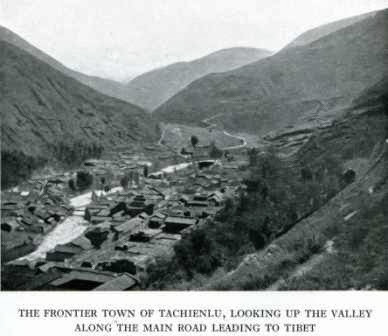 In the early 20thcentury Kangding 康定 (or Tachienlu, as it was then more commonly known), or དར་རྩེ་མདོ།Dartsendo in Tibetan, was very much a frontier town. It was here that the tea porters from China met and traded with the yak caravans coming from Tibet. It was a melting pot of trade, culture, and religions. Alongside the Tibetans and Chinese who made their livings there either as permanent or transitory residents, there was also a sizeable foreign community too. For the most part these foreigners were missionaries (some of whom were also medical doctors), but there were also traders, consular officials, academics (anthropologists; botantists; geologists, etc. ), and various other independent travellers. 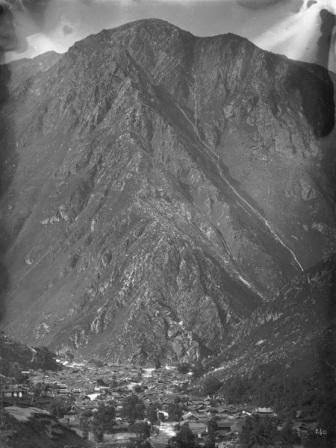 The missionaries were predominantly French Catholics and American Protestants, all of whom made Kangding one of their permanent bases, and from here they would travel out to their smaller mission stations scattered across the region. 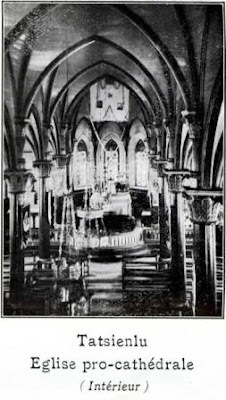 The French Catholics even built a sizeable church which can clearly be seen in this photograph of the town taken by the botantist, Joseph Rock, published in one of his articles for The National Geographic Magazine (October 1930). Rock was one of several noted travellers who passed through Kangding en route to eastern Tibet. Quite a few of these independent travellers published accounts of their journeys through the region, but a great number of their fellow contemporaries did not or if they did many of these accounts now languish in obscurity – in contemporary newspapers, magazines, private diaries and photo albums. I’m fascinated by all of these travellers and their motivations for making these journeys at such a turbulent time. None of them it seems were much put off by regular skirmishes between the various factions of the Chinese and Tibetan armed forces, as well as episodes of lawlessness and banditry on the isolated roads and mountain passes. There were times when towns as substantial as Kangding itself came under direct threat and even actual attack (see here). 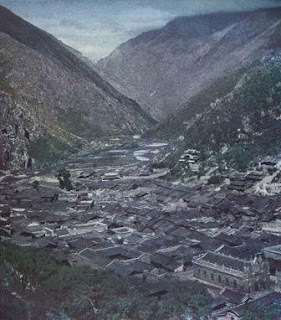 As one might well expect, much has changed in Kangding since those days around a century ago. 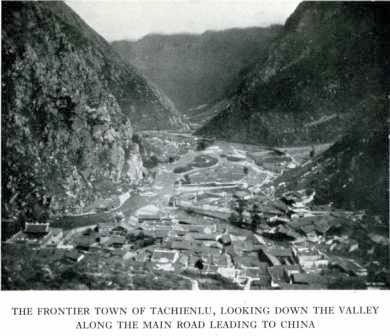 The once impressive town gates are now gone, and many of the low wooden buildings with their grey tiled roofs which were typical of Tachienlu have given way to modern concrete apartment blocks, some several stories high, and the bridges which span the river that runs through the town are now more numerous and more solidly built too. 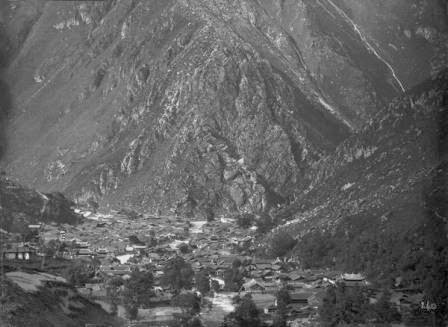 But elements of old Tachienlu remain. 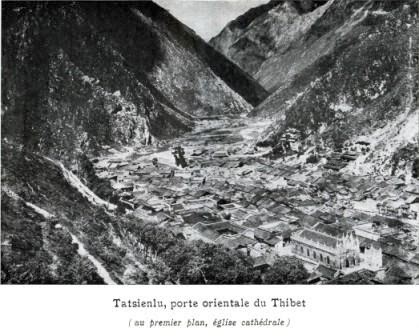 There are still quite a few old wooden and stone or brick built buildings with tiled roofs to be seen, particularly on the hillsides and at the outer fringes of the town; and, not least, there is the traditional architecture of the three large and fully functioning Tibetan Gombas (of which I shall write about in more detail in my next post). During my visit though I found a large part of the old town centre had recently been levelled and a huge excavation was then underway as part of a new development for a large modern shopping centre. Likewise, there is now no trace to be found of the old French Catholic church (which I guesstimate might have stood somewhere near the present town square?). However, there is both a modern Catholic and a modern Protestant church, as well as a mosque still serving their respective communities in Kangding. With the help of Kris Rubesh (who runs the excellent Zhilam Hostel, where I was staying) acting as translator, I spoke to Mr and Mrs Lao, two long time residents of the town. 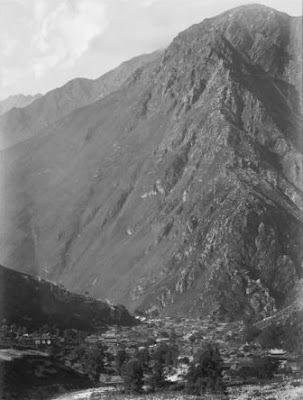 Mr Lao had lived in Kangding for 61 years and could remember of the old French Catholic church. Mr Lao said he recalled going into the church when he was a boy. His mother was an orphan who had been raised by the French missionaries, but he couldn’t remember when the church had been demolished. Mr Lao's wife had come to Kangding around 40 years ago and she said the church was already gone by the time she arrived, so she’d never seen it herself. 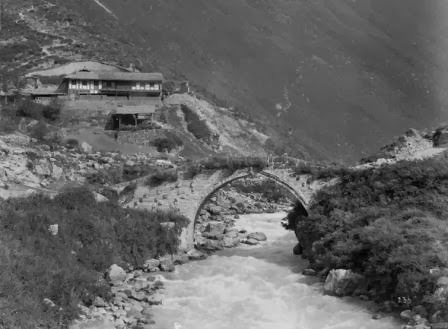 Although Mr Lao couldn’t recall when the church and all the surrounding buildings had been torn down, he did recall that there was a time when all the foreigners had had to leave Kangding. From my own researches I knew that the church had only narrowly escaped destruction in a great fire in 1921 which levelled a large part of the town, so if the church hadn’t been destroyed deliberately it’s quite likely that it could have succumbed to such a repeat disaster, or it could have fallen foul of one of the frequent landslides, inundations, or even earthquakes which occasionally hit the region. Whilst I was there I was fortunate enough to be able to take a look inside the modern Catholic church, which is curiously set atop a building that also consists of a series of ordinary shops at ground-level fronting one of the main streets beside the river. It was interesting to note that many of the missals in the pews appeared to be a lot older than the present building – although that’s no guarantee that they were transferred from the old church, they could well have come from further afield. The last view is of the Princess Wencheng Bridge, which according to some foreign traveller’s accounts was the last “Chinese-style” stone bridge which one would cross when travelling west, some even went so far as to describe it as "the Gateway to Tibet" (cf. Shelton; Kendall; Stevenson; Fischer; et al). It’s now very easily missed as the expanding town has subsumed its surrounds, hemmed in it stands as a pedestrian bridge running parallel to a modern road bridge and is enclosed by buildings on each bank. I crossed it a couple of times before I realised what it was. It is presumably named after Princess Wencheng, a niece of the Emperor Taizong of the T’ang Dynasty in China, who is said to have married Songtsän Gampo, the 33rd King of the Tibetan Yarlung Dynastyaround 640 AD.